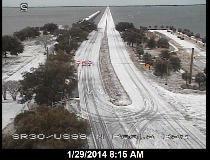 Ice and snow as seen from an FDOT camera on the Bay Bridge in far northern Florida, following a winter storm on 28–29 January 2014. Much of the Panhandle experienced significant ice buildup (from freezing rain and sleet) followed by a light snowfall. It is very rare for snow to fall in the U.S. state of Florida, especially in the central and southern portions of the state. With the exception of the far northern areas of the state, most of the major cities in Florida have rarely recorded measurable snowfall, though trace (T) amounts have been widely recorded, or flurries observed a few times each century. According to the National Weather Service, in the Florida Keys and Key West there is no known occurrence of snow flurries since the settlement of the region. In the Miami, Ft. Lauderdale, and Palm Beach there is only one known report of snow flurries observed (and in some areas a trace on the ground) in January 1977. Due to larger populations and more advanced communication networks, snow events are witnessed and reported much more frequently in recent years than in historical eras. Interpretations of this timeline must therefore be made with caution, as observed patterns may not reflect actual climate-related trends in annual snowfall but rather improved reporting. Additionally, the presence of rime or sleet being mistaken for snowflakes should also be considered. Finally, many of the reports below or not "official" National Weather Service reports, many being compiled by the newspapers and media, personal observations, and stories passed down through the years. January 16–19, 1893: On January 16, snow occurred at Palatka. On January 17, sleet fell at Oxford, and at Pensacola. Shortly after midnight on January 18, sleet began in the city of Jacksonville and then turned to snow and then to rain. That day, sleet also fell at Moseley Hall, Pensacola, and Tallahassee, and snow occurred at Lawtey. On January 18 and 19, sleet fell at Bristol. February 12/13, 1899: At 9:45 pm, rain changed to sleet at Jacksonville. Sleet then changed to snow at 10:15 pm and continued through the night, accumulating to 2 inches (51 mm) before sunrise at 7 am as the temperature plunged to 10 °F (−12 °C). The accumulation reached 4 inches (100 mm) at Lake Butler. In sheltered locations, the snow melted only several days later. This Great Blizzard of 1899 also affected much of the rest of the American South. Snowfall forecast for 28–29 January 2014, predicting over 1 inch of snow in northwest Florida. ^ a b c d e f g h i j k l m n o p q Davis, T. Frederick (1908). "Climatology of Jacksonville, Fla. and vicinity" (PDF). Monthly Weather Review. 35 (12): 566–572. Bibcode: 1907MWRv...35..566D. doi: 10.1175/1520-0493(1907)35<566:COJFAV>2.0.CO;2. Retrieved June 15, 2013. ^ a b c d e f Winterling, George (December 4, 2003). "Snow on the First Coast". News4JAX.com. Archived from the original on June 12, 2007. Retrieved January 22, 2007. ^ Harrington Jr., John A.; Cerveny, Randall S.; Dewey, Kenneth F. (August 1987). "A Climatology of Mean Monthly Snowfall for the Conterminous United States: Temporal and Spatial Patterns". Journal of Climate and Applied Meteorology. 26 (8): 897–912. Bibcode: 1987JApMe..26..897H. doi: 10.1175/1520-0450(1987)026<0897:ACOMMS>2.0.CO;2. ISSN 0733-3021. ^ Collins, Chris (1989). December 23-24, 1989 Christmas Snowstorm (Event Summaries/Case Review). United States National Oceanic and Atmospheric Administration's National Weather Service Forecast Office Newport/Morehead City North Carolina. Archived from the original on June 15, 2013. Retrieved June 15, 2013. ^ Armstrong, Tim (December 7, 2014). "Christmas Coastal Snowstorm: December 22-24, 1989". National Weather Service Wilmington. Archived from the original on November 13, 2016. Retrieved January 7, 2017. ^ Scanlan, Dan (December 22, 2014). "Lots of memories as Jacksonville marks the silver anniversary of 1989's freak snowstorm". Florida Times-Union. Retrieved January 7, 2017. ^ Forbes, James Grant (1821). Sketches, historical and topographical, of the Floridas; more particularly of East Florida. New York: C.S. Van Winkle. p. 60. ^ Williams, John Lee (1837). The territory of Florida, or, sketches of the topography, civil and natural history, of the country, the climate, and the Indian tribes: from the first discovery to the present time, with a map, views, etc. New York: A.T. Goodrich. p. 17. ^ Ellicott, Andrew (1803). The journal of Andrew Ellicott,: late commissioner on behalf of the United States during part of the year 1796, the years 1797, 1798, 1799, and part of the year 1800: for determining the boundary between the United States and the possessions of His Catholic Majesty in America, containing occasional remarks on the situation, soil, rivers, natural productions, and diseases of the different countries on the Ohio, Mississippi, and Gulf of Mexico, with six maps, comprehending the Ohio, the Mississippi from the mouth of the Ohio to the Gulf of Mexico, the whole of West Florida, and part of East Florida: To which is added an appendix, containing all the astronomical observations made use of for determining the boundary, with many others, made in different parts of the country, for settling the geographical positions of some important points, with maps of the boundary on a large scale; likewise a great number of thermometrical observations made at different times and places. Philadelphia: Budd and Bartram for Thomas Dobson (printer). pp. 116, 121. ^ Blodget, Lorin (1857). Climatology of the United States: and of the temperate latitudes of the North American continent, emberacing a full comparison of these with the climatology of the temperate latitudes of Europe and Asia, and especially in regard to agriculture, sanitary investigations, and engineering with isothermal and rain charts for each season, the extreme months, and the year, including a summary of the statistics of meteorological observations of the United States, condensed from recent scientific and official publications. Philadelphia: J. B. Lippincott & Co. p. 147. ^ a b c ""Today in Florida History" for January". Flahistory.net. Archived from the original on September 28, 2007. ^ "Sleet" (PDF). Monthly Weather Review. 15 (1): 15. January 1887. Bibcode: 1887MWRv...15...12.. doi: 10.1175/1520-0493(1887)15[12:P]2.0.CO;2. Retrieved June 14, 2013. ^ Starr, Gregory T. (January 1892). "1892-01 COOP Publication for Madison, Florida" (PDF). National Climatic Data Center. Archived from the original (PDF) on March 29, 2013. Retrieved February 25, 2013. ^ a b c d e ""Today in Florida History" for February". Flahistory.net. Archived from the original on December 27, 2003. Retrieved January 22, 2007. ^ "Report of the Florida Weather Service for the month of December, 1892" (PDF). National Climatic Data Center. December 1892. Archived from the original (PDF) on March 29, 2013. Retrieved February 25, 2013. ^ Garriott, Edward B. (1906). Cold waves and frost in the United States. Bulletin P (WB No 355 ed.). United States Weather Bureau. p. 17. Retrieved February 25, 2013. ^ Keith C. Heidorn (2006). "Significant Weather Events in November in the United States". Retrieved January 22, 2007. ^ a b Joe Disco (2003). "December 12 Time Capsule". Retrieved April 9, 2007. ^ Liz Osborn. "Record US Snowfalls For One Day". Current Results Nexus. Retrieved July 19, 2012. ^ Flahistory.net. ""Today in Florida History" for March". Archived from the original on August 27, 2008. Retrieved January 22, 2007. ^ Butson, Keith (April 1, 1958). "Florida's Winter Weather: 1957–58". Weatherwise. 11 (2): 58–74. doi: 10.1080/00431672.1958.9925018. ISSN 0043-1672. ^ a b Keith C. Heidorn (2002). "Miami's First Snowfall". Retrieved January 22, 2007. ^ "Life: The great Tampa Bay snow of '89". Sptimes.com. Retrieved June 15, 2013. ^ Reuters News Service (December 26, 1989). "4 die as Florida citrus, vegetables freeze". Pittsburgh Post-Gazette. Retrieved December 31, 2012. ^ National Climatic Data Center (1993). "Event Report for the '93 Superstorm". Archived from the original on April 16, 2009. Retrieved February 28, 2008. ^ Krueger, Curtis; Kameel Stanley (January 9, 2010). "Sleet falls for first time since 1996 in northern Tampa Bay area". St. Petersburg Times. St. Petersburg, FL. Archived from the original on October 4, 2013. Retrieved October 4, 2013. ^ Jeffrey M. Medlin (2005). "Evolution of a Central Gulf Coast Heavy Snowband — December 18, 1996". Mobile, Alabama National Weather Service. Archived from the original on January 13, 2007. Retrieved April 9, 2007. ^ Melbourne, Florida National Weather Service (2003). "Cold Temperatures and Snow Flurries in East-Central Florida". Archived from the original on January 21, 2007. Retrieved January 22, 2007. ^ a b Associated Press (November 26, 2006). "Snow falls in central Florida as state endures unusual Nov. cold snap". USA Today. Retrieved January 22, 2007. ^ "Snow Flurries in Florida". WJHG-TV. February 3, 2007. Archived from the original on February 6, 2007. Retrieved February 16, 2007. ^ "Snow Flurries in Florida". CNN. 2007. Archived from the original on January 4, 2008. Retrieved January 3, 2008. ^ "Sleet, Snow Fall In Parts Of Central Florida". WFTV. January 10, 2010. Archived from the original on November 20, 2010. Retrieved June 14, 2013. ^ "Preliminary Local Storm Report". National Oceanic and Atmospheric Administration. Retrieved July 19, 2012. ^ "Snowfall Accumulations From February 12th". National Weather Service. Retrieved July 19, 2012. ^ "Snow Forecast 02-14-10". National Weather Service. Archived from the original on June 6, 2011. Retrieved July 19, 2012. ^ "Let it Snow! Let it Snow! (With Photo Gallery)". NorthEscambia.com. December 8, 2010. Retrieved July 19, 2012. ^ Winkle, Amanda (December 26, 2010). "Many Jacksonville.com users report snow flurries across Northeast Florida". The Florida Times-Union. Retrieved December 26, 2010. ^ "History for Tampa Executive, FL". wunderground.com. December 28, 2010. Retrieved July 19, 2012. ^ "Sleet Reported In Escambia, Santa Rosa (With Photo)". NorthEscambia.com. January 9, 2011. Retrieved July 19, 2012. ^ "Sleet, snow flurries falling on Gulf Coast". Pensacola News Journal. Pensacola, FL. January 24, 2014. Retrieved January 24, 2014. ^ Daryl Herzmann. "IEM :: LSR from NWS JAX". Mesonet.agron.iastate.edu. Retrieved January 3, 2018. ^ "Escambia, Santa Rosa closures, cancellations". Pensacola News Journal. January 28, 2014. Retrieved January 29, 2014. ^ "Winter weather updates". NWFnewsonline.com. January 28, 2014. Archived from the original on January 29, 2014. Retrieved January 29, 2014. ^ "Gulf Power". Facebook. Retrieved January 29, 2014. ^ "Pensacola Weather". The Weather Channel. Retrieved January 29, 2014. ^ "Winter Storm Leon Leaves Icy Mess in Pensacola, Parts of Florida Panhandle; Drivers Urged to Stay Off Roads". The Weather Channel. January 29, 2014. Archived from the original on February 21, 2014. Retrieved January 29, 2014. ^ "Pensacola International Airport". Facebook. Retrieved January 29, 2014. ^ Matthews, Blake (January 9, 2015). "Thursday's flurries set Florida record". News 4 Jax. Graham Media Group. Retrieved January 23, 2016. ^ "Snow flurries great Northeast Florida, Southeast Georgia". firstcoastnews.com. January 8, 2015. Archived from the original on January 17, 2015. Retrieved January 9, 2015. ^ "Snow flurries reported west of Tallahassee". WESH-TV. Hearst Properties. January 22, 2016. Retrieved January 23, 2016. ^ "Sunshine State Sees Snow In Gainesville, Jacksonville". Miami, FL: WFOR-TV. January 23, 2016. Retrieved December 9, 2017. ^ "Tallahassee Regional, FL History | Weather Underground". Weather Underground. Retrieved December 3, 2018. ^ Erdman, Jonathan (December 9, 2017). "Snow Fell in South Texas, Along the Gulf Coast, Even the Florida Panhandle During Winter Storm Benji". The Weather Channel. Retrieved December 9, 2017. ^ @NWSJacksonville (January 3, 2018). "Precipitation is overspreading the Suwannee Valley from south to north as of 3 AM, with dewpoint temps in the teens across Columbia, Suwannee & Hamilton Cos. Surface temps will fall into the 20s through the predawn hours, with significant icing expected to commence by 5 AM #flwx" (Tweet) – via Twitter. ^ "Weather Briefing" (PDF). NWS Jacksonville Weather Forecast Office. January 3, 2018. Archived from the original (PDF) on January 3, 2018. Retrieved January 3, 2018. ^ "URGENT - WINTER WEATHER MESSAGE". NWS Tallahassee Weather Forecast Office. January 3, 2018. Archived from the original on January 3, 2018. Retrieved January 3, 2018. ^ a b "How cold is it? Snow is falling in Florida". Sun-Sentinel. January 3, 2018. Retrieved January 3, 2018. ^ a b "'Bomb Cyclone': Rare Snow in South as North Braces for Bitter Cold". The New York Times. January 3, 2018. Retrieved January 3, 2018. ^ Klas, Mary (January 3, 2018). "It's snowing in Tallahassee for the first time in three decades". Miami Herald. Retrieved January 3, 2018. ^ Rosenblatt, Kalhan (January 3, 2018). "Florida sees snowfall as winter weather and cold air grips East Coast". NBC News. Retrieved January 3, 2018. ^ Burlew, Jeff; Effers, Karl (January 3, 2018). "Interstate 10 reopens after winter storm". Tallahassee Democrat. Retrieved January 3, 2018. ^ @NWSEastern (January 3, 2018). "Some snowfall and ice accumulation reports received by NWS forecast offices in South Carolina, Georgia and Florida as of 4 pm" (Tweet) – via Twitter.